Super Starfish can automatically store your progress in the cloud, allowing you to restore it on another device. 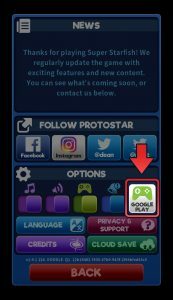 To do this, first make sure your original device with your progress is connected to Google Play Games. 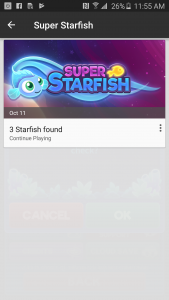 Super Starfish will attempt to automatically log into Google Play Games once the game starts. 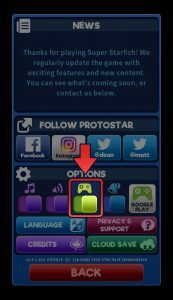 You can tell if the game has connected successfully as the Google Play button in the Options menu will become active. 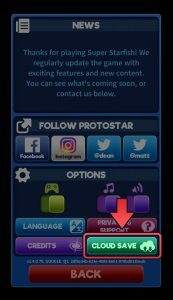 If you have logged out of Google Play Games or cancelled the sign-in process you can also manually sign in by going into Starfish’s Options menu and manually toggling the Google Play Games slider to ON. Once you’ve connected to Google Play Games, your game will be saved to the cloud. After this it can be restored on a different device. Log into Google Play Games on your new device using the same ID as on your original device (see above). 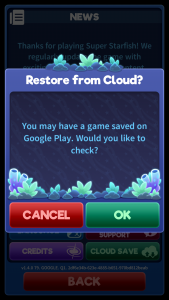 You can then check to see if you have any saved games stored in the cloud by tapping the “Cloud Save” button in the game’s Options screen. Tap OK to check for online Saves. This screen shows all of the saves stored on your cloud, just select the one you want and the game will restore to it.